Gun ownership is dependent upon responsible individuals. A gun is an object which can spell life or death for another living being, and guns should be treated with all the respect that is due to something so powerful. Irresponsible gun owners only provide fuel for the fire that is rising anti-gun sentiment nationwide. There are a few ways that you can ensure you are a gun owner who does everything in their power to be responsible. This includes understanding proper firearm drill and handling techniques, knowing how to clean your firearm and maintain it and knowing how you should store your gun (as well as having a dedicated storage space for it). Many first-time gun owners make the mistake of thinking that their training stops the day they get their hands on their gun. Make no mistake; your training never stops when you are a gun owner. You should always be ready to learn more about gun ownership. A mindset in which you believe you know everything there is to know is an irresponsible mindset. 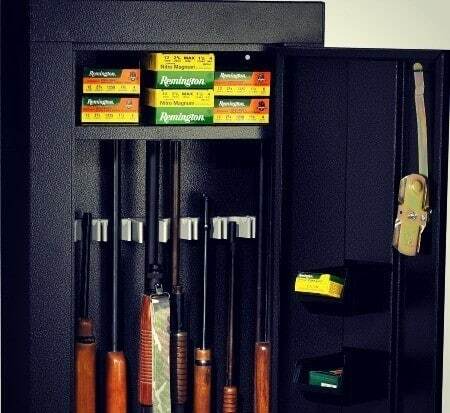 Properly storing your gun is one of the most important parts of gun ownership for a variety of reasons. Many people make the mistake of thinking that there is no need to securely store their weapon just because they live alone. Guns are some of the most tempting targets for burglars, so your gun should always be inaccessible to anyone but you. Guns are expensive items, many firearms owners have spent well into the thousands of dollars on their collection, and it would be a shame for a burglar to undo all of that hard work. Keep in mind that stolen guns are also a danger to the community, as they are the main source of black market firearms. Before you purchase​ a top reviewed rifle and gun storage cabinet on the market, it is important to consider the weight. Weight has a few functions when it comes to a gun cabinet. 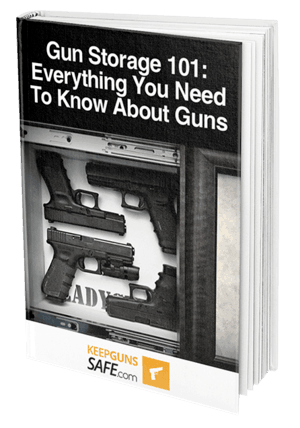 First, you should know the weight of your gun cabinet, so you know whether or not you will end up needing help when it comes time to install it in your home. The weight of your cabinet also has the function of ensuring that a thief or burglar cannot simply dolly your gun cabinet away so they can break it open elsewhere. The weight of your cabinet will also depend on the material it's made of so it can have an indirect correlation with the durability. Unlike a gun safe where you can bolt it to the floor, a gun cabinet remains merely planted on the ground. A feature which is an important inclusion in a gun cabinet is the inclusion of a multipoint lock. These types of locks are aptly named as they bar the door at several different points as opposed to a single point. Multipoint locks have the benefit of making the overall locking mechanism stronger by eliminating any possible weak points. Multipoint locks are named for the number of points at which the door locks. For example, a three point lock will have three locking points, where a two point lock will only lock at two different points along the door. Homak is this product's manufacturer, and it is intended to blur the line between a gun safe and a gun cabinet. While it features the same size as a larger model of the gun cabinet, it is also designed similarly to an upscaled safe, featuring a 4 point lock, 1.2mm thick steel, and a durable door. 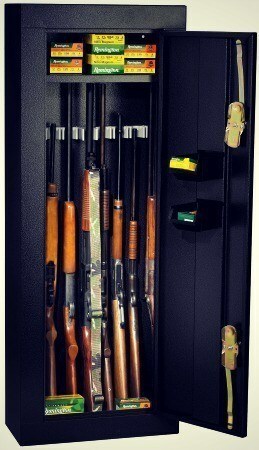 This gun cabinet is meant to combine high capacity and high build quality, and we found that it does so rather well. With enough barrel rests and space for eight rifles or shotguns, you will find that this cabinet can fit a larger than average collection of long guns with enough room for models featuring long barrels. The most impressive feature of this gun cabinet is the inclusion of a tubular style four point lock, meant to make the door of this safe nearly impenetrable to all but the most dedicated of crooks. 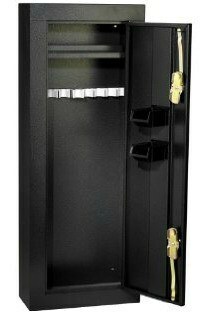 As we stated earlier, this is a storage option with the size of a gun cabinet but the added security features of a safe. There are also removable plastic bins positioned on the door of the safe so you can safely store your ammunition and accessories for your stored guns. This gun cabinet is one of the tallest models you will find available at 57 inches; this results in a cabinet with a good amount of interior room when coupled with the eight gun storage space. This section is meant to give you further perspective on this product by providing information on how customers received this product. Regarding positives, many buyers were impressed by the amount of room there is for long guns. The inclusion of enough depth for scoped rifles was particularly well received by many customers. Regarding negatives, customers were not impressed by the removable plastic storage bins. They stated that the bins feel flimsy and lacking in durability when compared to the rest of the safe. Most customers would have preferred a dedicated extra storage space for ammunition and accessories. This model of gun cabinet usually sells at around an above average price point, but it can sometimes be found on sale​. If you can find it on sale, it is more than worth the price. It can be found for sale online at Amazon.com amongst other retailers. If you are in the market for a gun cabinet with a superlative degree of durability and resilience, you will find that this model from Homak is an excellent option. We hope that this review has proved helpful in deciding on the right gun cabinet for your needs. If there are any questions or concerns, feel free to leave them in the comments section.